The botulinum neurotoxin is a common medicine for the treatment of a wide range of neuromuscular disorders, including muscle spasms, overactive bladder, cervical dystonia, and cerebral palsy (CP), as well as chronic migraine, and hyper-sweating. A team from Stockholm University, in collaboration with Ipsen Bioinnovation and Harvard Medical School, has now determined the molecular details of why a botulinum toxin variant, that they have designed, has enhanced receptor-binding properties. This engineered toxin shows great promise as a drug candidate. Structure of the engineered botulinum neurotoxin bound to its human receptor. Botulinum neurotoxins act at the neuromuscular junction to inhibit the transmission of neurotransmitters and cause paralysis. One of the key properties of the toxin is how it specifically recognises neurons. A team from the Department of Biochemistry and Biophysics, Stockholm University led by Associate Professor Pål Stenmark studies the molecular mechanisms by which these toxins bind neuronal cells. 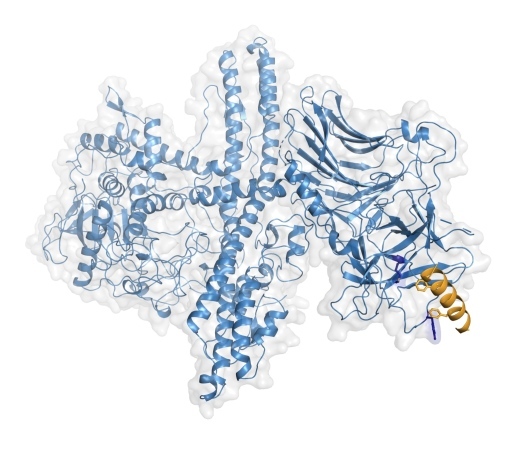 Pål Stenmark and his research team have used X-ray crystallography to determine the high-resolution structures of the engineered toxin bound to its human receptors. Their previous structural studies were crucial for the successful engineering of the toxin (Nature communications, 2017 Jul 3;8(1):53.). Integration of these results with the promising clinical analysis indicate that enhanced receptor-binding improved the medicinal potential of this new toxin. The study is published in the journal Science Advances. “Being able to see the precise atomic interactions between the toxin and its receptors really help us design new molecules with enhanced properties. We hope this study will lead to further development of efficient biological drug products”, says Dr Geoffrey Masuyer at the Department of Biochemistry and Biophysics, Stockholm University and one of the study’s lead authors. “We are very excited about this project. It is a good example of how academia and pharmaceutical companies can work closely together to further basic science and develop new therapeutics", says Associate Professor Pål Stenmark at Stockholm University (now Lund University). Business advisors form SU Innovation has been supporting the researchers from Stockholm University throughout the project, including ensuring their intellectual properties in the contracts with Ipsen Bioinnovation and Harvard Medical School. - SU innovation made this cooperation with Ipsen Bioinnovation possible, which has been very valuable. We´ve received important and specific support, especially within the areas of contracts and intellectual property rights, an area difficult to navigate without legal training, says Associate Professor Pål Stenmark at Stockholm University (now Lund University).